Functional principal component regression (FPCR) is a promising new method for regressing scalar outcomes on functional predictors. 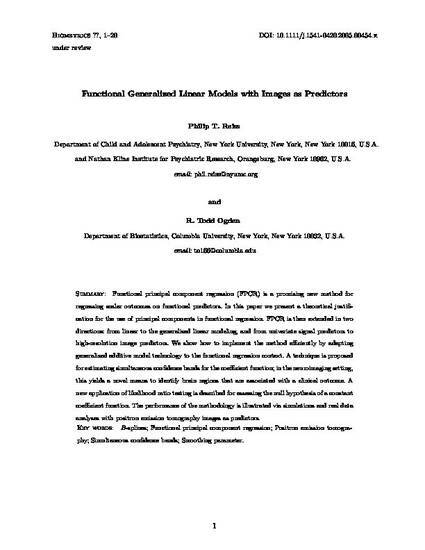 In this paper we present a theoretical justification for the use of principal components in functional regression. FPCR is then extended in two directions: from linear to the generalized linear modeling, and from univariate signal predictors to high-resolution image predictors. We show how to implement the method efficiently by adapting generalized additive model technology to the functional regression context. A technique is proposed for estimating simultaneous confidence bands for the coefficient function; in the neuroimaging setting, this yields a novel means to identify brain regions that are associated with a clinical outcome. A novel application of likelihood ratio testing is described for assessing the null hypothesis of a constant coefficient function. The performance of the methodology is illustrated via simulations and real data analyses with positron emission tomography images as predictors.